A strange blog filled with biohazard signs and vague zombie references has set the Resident Evil 6 rumor-train off at speed. Despite the fact that Capcom is yet to even confirm its existence beyond saying it will be "different," Resident Evil 6 remains alive and well in the world of internet rumors. The last rumor to reach us involved two voice actors' resumÃ©s which listed Resident Evil 6 credits including "Chinese villager/zombie." Now, a suspiciously clean-looking blog festooned with biohazard signs (Biohazard is the name Resident Evil goes by in Japan) and a video of a Mandarin-speaking woman crying in fear in a darkened room has appeared. The date 01/19/12 appears frequently on the site in various guises, and the internet is awash with speculation over its meaning and origin. 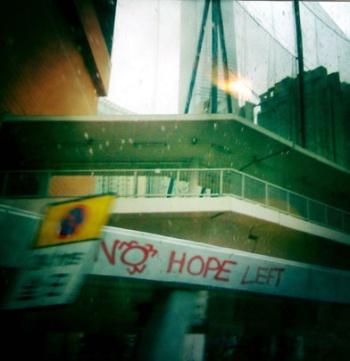 Titled "nohopeleft," the "blog" is home to a collection of images of global destinations (many locations can be deduced through little markers left in the pictures, such as language references, road signs, or other features) with biohazard signs and the phrase "no hope left" scribbled all over them. Each picture has a range of comments in a very well-balanced selection of languages, complete with contrived spelling mistakes. The comments on the subtitled video of the woman crying are fairly telling - some good English, some bad English, and some perfect French - with messages like "wat happened," "if you pause you can see another biohazard sign," and "call the authorities you freaks." So far, so seemingly-made-up. However! For further proof, interested parties over at NeoGAF set about trying their best to connect the site to Capcom. The closest they could come was managing to unearth the fact that both nohopeleft.com and Inserted Evil (a viral site for Resident Evil: Operation Raccoon City, which has been directly tied to the game) are, according to a Whois search, registered under WEBFUSION LTD. of Surrey, England. It isn't proof by any means, but it does represent a neat coincidence. Whether or not this is directly tied to Resident Evil 6 remains to be seen. My spider-senses tell me that the site is a manufactured one, but does it necessarily have to be for this specific game? While the whole Biohazard angle and the shared Whois registration would seem to say so, we live in a world infested with globe-spanning post-apocalyptic epics of many different shapes and sizes. The site's fascination with the 19th of January hints at something more substantial being revealed on that date, so hopefully we won't have to wait too long for clarification. UPDATE: A sleuth at thesixthaxis has uncovered something that looks alarmingly like proof of Capcom's connection to the "no hope left" campaign. The writer lives near one of the graffiti'd billboards in London; after going down to investigate the poster, he called the billboard company and asked who was renting the space. According to him, the company replied, "CAPCOM." Oh my. Thanks for the tip, CosmicGrenade!